Full name Steven Paul Jobs. 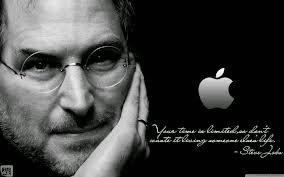 Steve was born on 24 February 1955 in San Francisco which is in California. He was adopted by Abdulfattah Jandali and Joanne Schieble who were unmarried at the time. He did his schooling from Homestead High School in Cupertino California and then went to Reed College in Portland in 1972 but he dropped out after one semester. After that he took a job with video game manufacturer Atari to earn enough money for a trip to India and then returned from there a Buddhist. After back in Cupertino he returned to atari where his old friend Steve wozniak was still working. Steve Wozniak was building his own computer and in 1976 Jobs already sold 50 of the as-yet unmade computers to local store and buy the components on credit solely according to strength of the order and enabling them to build the Apple I. The Apple II build in 1977 and the company Apple Computer was formed after that. The Apple II was credited with starting the personal computer boom and its popularity reminding IBM to rapidly develop their own PC’s. By the time production of the Apple II was ended in 1993 it had sold approx 6 million units of computers. Inspired by a trip to PARC (Xerox Palo Alto Research Center), engineers from Apple began working on a commercial application for the GI (graphical interface) ideas they had seen there. The resulting machine is Lisa and it was expensive and that’s because it never achieved any level of commercial success. But in 1984 another Apple computer in which using the same WIMP (Windows, Icons, Menus and Pointer) interface concept and was launched. In 1984 Super Bowl, directed by Ridley Scott gives the Macintosh computer to the world. In 1985 Jobs was fired from Apple and after 6 months he founded another computer company, named NeXT. Its machines were not a commercial success but some of the technology was later used by Apple when Jobs finally returned there. In the middle of 1986, Steve Jobs bought The Computer Graphics Group from LUCASfilm. The group was working in making high end computer graphic hardware but under its new name, PIXER, it began to design innovative computer animations. In 1996 Apple bought NeXT and Jobs returned to APPLE, and happily becoming its CEO. With the help of British born industrial designer Jonathan Ive, Steve Jobs brought his own philosophy back to the Ailing company and began to turn it’s around with the release of the iMac in 1998. The company's MP3 player, the iPod was followed in 2001, the I Phone launching in 2007 and the I Pad in 2010. The company's software music player, I Tunes, develop into an online music store.